For the last six Monday nights, I've been taking a "lost wax casting" class at devil's workshop. It's been super fascinating and fun! The process starts with wax bools, which you carve into the objects that you want. I choose to make rings, but several of the other students made pendants and necklaces; you could theoretically make almost anything (as long as it's small). The wax is then cast with a super fine grained ceramic material, making a mold. The wax is melted out of the mold, which means that it's possible to mold any shape - you don't have to worry about how to get the original out of the mold (and this is also why it's called lost wax casting - the wax is lost). Then, molten metal (we used both brass and sterling silver, but you could theoretically use gold or pewter or whatever) is poured into the mold, forming a metal object with the same shape as the wax original (plus of course the "spru", a chunk left from where the metal enters the mold). The mold itself is then disolved in water, so that you can obtain the cast metal. The process is kind of nerve-wracking, since you loose not just the original wax object (which you invested hours in making! ), but also the mold of that object! And there is no guarantee that it will turn out like your wax original. 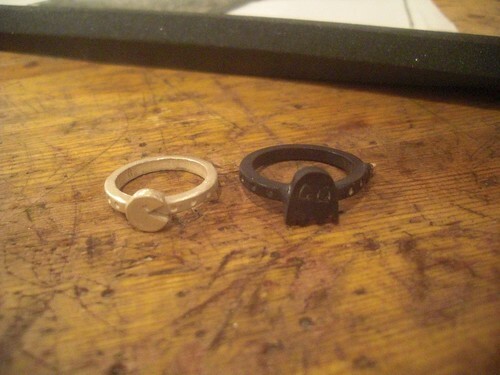 Anyway, I had a great time, and four of the five rings that I made ended up turning out pretty well. Pictured is the "pac man" and "ghost" rings, in Sterling Silver. I also made a prototype "Mood Ring" in brass, basically a ring base which holds the circuit board for my next sensebridge product. It's a pretty big upgrade over the wire-wrapped version that I made earlier, but neither of those two designs are manufacturable, so I've got yet a third scheme in the works for it now. The final ring is a simple brass ring with grooves and a spike at the top, it's very mean looking :-). The ring that didn't turn out was going to be a brass "space invaders" ring, with a relief of the 8-bit space invader shape, it's super sad that it didn't work, but it was also the most ambitious of my projects there, so it's not surprising that it's the one that failed. The workshop was a lot of fun and I learned a lot, so if you're curious about how jewelry is made, I highly recommend it! See my complete Devil's Workshop Flickr Set. It was also interesting for me to see that my friend Jonathan did some lost wax casting during the same time period: 3D-printing and lost wax casting: Question Block cufflinks and crowbar pendant. The project looks interesting enough. You can even ask a gold buyer long island on the process. Looks like a very interesting hobby to be immersed in! I would love to enroll in a class like that myself as I have recently discovered my innate fascination with artisan jewelry rings myself. I love to attend there too but I'm kinda scared of the name of the workshop. Is that intended for artisan silver jewelry rings collector too? I really love that! I'd like to see if the process was as easy as gold formation. Gold buyer tennessee find it fascinating that he even wanted to learn lost wax casting. I really love that! I'd like to see if the process was as easy as the gold formation. Gold buyer tennessee find it fascinating that he even wanted to learn lost wax casting. Buying gold uk would definitely be worth it when I get to have my DIY jewelry project. These designs are fascinating. I suggest you turn that pet project into a business. If you play your cards right, you might just be able to rival even the biggest melbourne jewellers.